Arum lily or Calla Lily called Zantedeschia are available in an increasing number of shades and varieties. This Zantedeschia rehmannii can be grown to advantage in a terracotta pot that will show off the perfect spathes or funnel shaped petals. Arum Lily is the common name for the hardier outdoor variety. Usually white or pink. 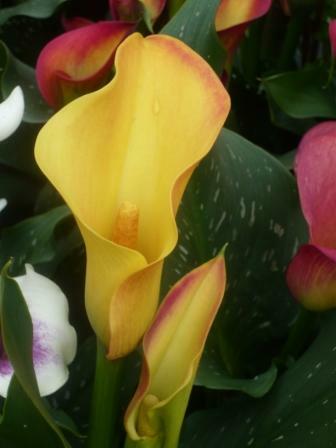 Calla Lilys are often the less hardy but colourful varieties in white, yellow, pink, red or purple and are easy to grow from bulbs. Zantedeschia have heart shaped leaves often with decorative spots. 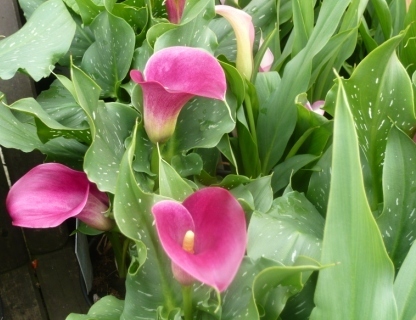 Zantedeschia will flower for long periods throughout the summer with dramatic and exotic shaped flowers. They are not frost hardy so they should not be planted out until after the end of May in the border or pots. I bury the pots to fill odd gaps and can easily bring them indoors in winter. Grow them in one and a half litre pots with loam-based compost such as John Innes No 2 and plant the rhizomes just showing at the surface of the container with the eyes of the rhizome uppermost. Water freely through the summer and feed with a balanced liquid fertiliser every two weeks until the flowers have faded. They make exotic houseplants as well as summer border or container plants. ‘This is an old fashioned, but very rewarding garden plant. Zantedeschia is named after Professor Zantedeschi, probably Giovanni Zantedeschi, 1773-1846, an Italian physician and botanist, although there is some uncertainty about this. Although called the arum lily, it is neither an arum ( the genus Arum) nor a lily ( genus Lilium). But it is associated with the lily as a symbol of purity and these elegant flowers have graced many bridal bouquets. It is an excellent cutflower and lasts a long time in water. Nowadays there are other forms of this species which will enliven an old theme. The ‘Marshmallow’ with a creamy pink spathe (outer “petal” which is actually a modified leaf) and rose-pink throat and the ‘Green Goddess’with a green and white spathe. There is also an attractive form with leaves spotted white. The striking arum lily “flower” is actually many tiny flowers arranged in a complex spiral pattern on the central column (spadix). The tiny flowers are arranged in male and female zones on the spadix. The top 7 cm are male flowers and the lower 1.8 cm are female. If you look through a hand-lens you may see the stringy pollen emerging from the male flowers which consist largely of anthers. The female flowers have an ovary with a short stalk above it, which is the style (where the pollen is received). The spadix is surrounded by the white or coloured spathe. According to Marloth, the whiteness of the spathe is not caused by pigmentation, but is an optical effect produced by numerous airspaces beneath the epidermis. The flowers are faintly scented and this attracts various crawling insects and bees which are responsible for pollinating the flowers. Cross pollination occurs as the anthers of each flower ripen before the ovaries. A white crab spider of the family Thomisidae visits the flower to eat the insects. This spider does not spin webs and uses its whiteness as camouflage against the spathe. In the western Cape, a tiny frog Hyperolius hopstocki is also attacted to the arum lily flowers. The spathe turns green after flowering and covers the ripening berries. It rots away when these are ripe and the succulent yellow berries attract birds, which are responsible for seed dispersal. i have been bought this plant as a preasant, i absolutly love it. i have to ask one question though………….my plant forms what is like due drops at the end of each of its leaves, is it supposed to do this and why? thank you to anyone who knows the answer and can help. Why does the outer leaves keep rotting and falling off my Calla Lily, it has just been repotted after being purchased at Hampton Court Flower Show? I recently bought a Calla lily,and repotted it now the leaves keep rotting and falling off,why is this……. I have some calla lilies which I grew for the first time in pots and wondered how to look after them in winter. Do all the leaves die? Do you remove the old leaves? should the containers be brought inside or would a cold greenhouse suffice? Treat Calla Lilies like Dahlias, cut off leaves and stems, allow to dry, cover in peat and store in frost free conditions. You may be lucky leaving them in the ground with plenty of mulch but I wouldn’t take the risk. In my experience with this plant has proved it to be tough and easy. I am in the south east of England where temperatures dropped a few times to around -5 this past winter, and for about a week the daytime temperature didn’t even rise above freezing. Zantedeschia aethiopica just bounces back once the spring arrives and now, towards the end of May the first few flowers are open, and plenty more spathes are waiting to unfurl. I also have some of the smaller varieties of Zantedeschia that are supposed to be more tender but they are just starting to poke through the ground now. My tip for overwintering these is to buy the dormant tubers rather than being tempted to purchase when in full flower and looking beautiful. Plant the tubers around 10 inches deep, and although it takes longer for them to get going, each year we are rewarded with bigger and bigger clumps. One last tip – if you plant Zantedeschia aethiopica against a house wall, during milder winters, it will stay evergreen and flower extra early! Happy gardening! I’ve repoted the Zantedeschia Calla into a larger pot but the flowers have died and the leaves are turning yellow. But i have watered them regularly.Where have i gone wrong? Sorry about your potential fatality but it may be due to over watering. Let the bulb dry and sleep and repot for next year. Three days ago I was given a healthy Z calla (purple). It’s placed on an island in a well lit kitchen diner. The stems are rotting and collapsing. I did not water it but it is not bone dry. What can I do to save it? Is it suspect to draughts? i have been given a calla lillie as a present and the leaves keep drooping, dying and being very wet, also the leaves keep having droplets on the ends which keep dropping onto my window sill and idea’s why please? I have repotted my arum lily from one pot to two three years ago. since then it has flourished as a lovely green plant but never flowered since.any tips to help it flower? Sorry to comment here, I know this is an older post. I’ve just been looking for information to help with this. I’ve bought a Zantedeschia which was positioned indoors in the garden centre. Very misleading I think, as I just purchased it thinking it was an indoor plant. It has suffered greatly until I found it what it was and that it’s in fact an outdoors plant. All the leaves have been going bright yellow in turn, and dripping water off the ends of the leaves. I’ve since plonked it outside, but I fear it’s the end of it, to be honest. I’ll follow Paul’s advice to try and help it.